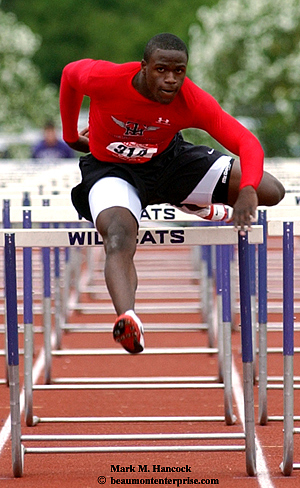 Port Arthur Memorial High School's Jamaal Charles clears the final hurdle in the boys 5A 110 Meter Hurdles during the Region III Track & Field Championship at Turner Stadium in Humble on Saturday, April 30, 2005. Charles, ranked No. 2 nationally in the hurdles, won the race. He beat the No. 1 and No. 3 nationally-ranked hurdlers to advance to state. I'd guess state could be a let down after this race. 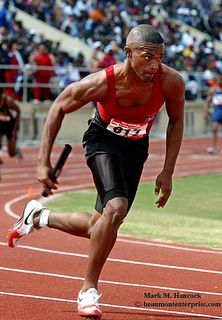 Jasper High School's Louis Adams kicks off the opening leg of the boys 4x200 Meter Relay during the Region III Track and Field Champioinship at Turner Stadium in Humble on Saturday, April 30, 2005. Rich Dottellis of the Texas Forest Service back-burns a fire in Evadale on Thursday, April 28, 2005. 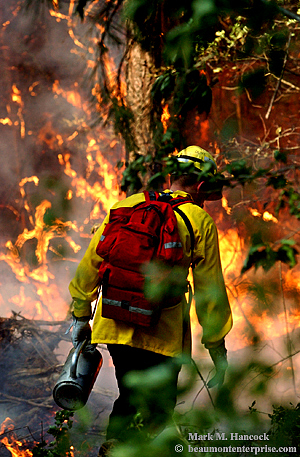 Many small fires have blazed in the area due to dry underbrush conditions. Award Winner: 2nd place, News photo, Hearst Honors April clip contest. 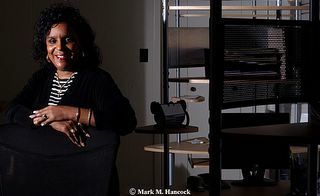 Tammy Powell, president of The Invisible Armor, poses for a portrait at her office in Beaumont on Thursday, April 28, 2005. The company is the exclusive distributor of the antibacterial skin lotion. 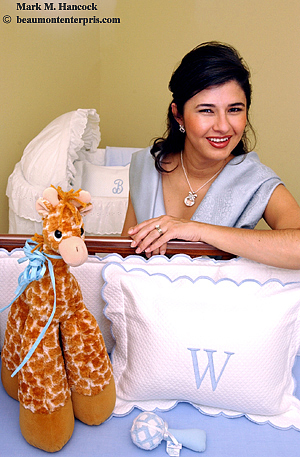 West Brook High School junior Lauri Thibaut poses for a portrait at the school in Beaumont on Thursday, April 28, 2005. Thibaut was named by The Beaumont Enterprise to the Super Gold Soccer Team and the girls soccer player of the year. 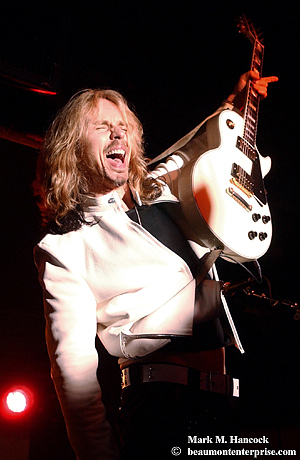 Tommy Shaw holds a note on his guitar during a Styx concert at Cactus Canyon in Beaumont on Thursday, April 28, 2005. The band is touring with concerts to promote their new album titled "Big Bang Theory," which is scheduled for release on May 10, 2005. 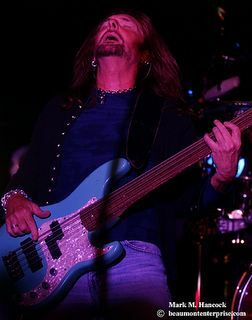 (Right) James Young plays his guitar as Styx performs at Cactus Canyon in Beaumont. (Below) Ricky Phillips plays the bass guitar during a Styx concert. If you'd like to read some local bloggers' reviews on the concert, please check out Miss New Orleans and Wang Chi's House of Pancakes. 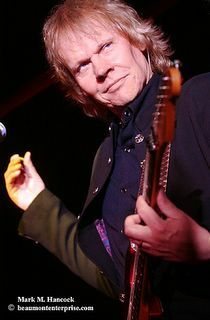 Additionally, Tommy Shaw was running a quasi-blog (no archive) about the tour on the band's official Web site. 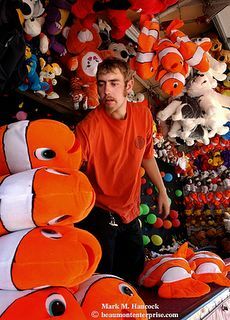 David Carmon of Hall Wyoming prepares prizes in a game booth at the Beaumont Fairgrounds before the Golden Triangle Fair on Wednesday, April 27, 2005. 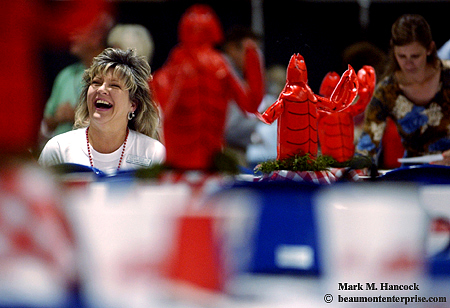 The fair will share space Sunday with the Boys' Haven Crawfish Festival. The one-day festival will include live music, crawfish cook-off, classic car show and more. 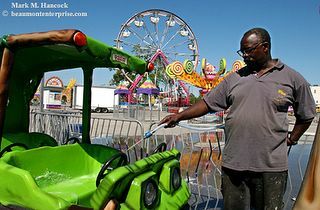 The two-week fair will include rides, food, games, exhibits, entertainment, a white tiger show, a petting zoo and more. Darron Powe of Milwaukee, Wisc. prepares a ride for guests at the Beaumont Fairgrounds before the Golden Triangle Fair on Wednesday, April 27, 2005. The two-week fair includes rides, food, games, exhibits, entertainment, a white tiger show, a petting zoo and more. Explorer Aircraft Inc. director of flight standards W.H. 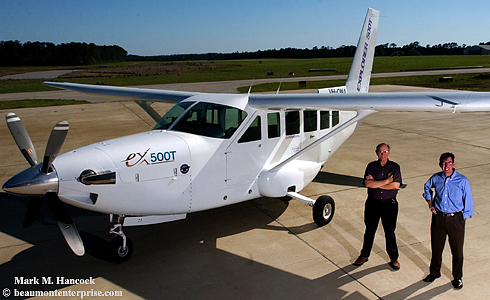 "Sam" Ketchum (left) and president Bryan E. Lynch (right) pose for a portrait next to one of the company's products at the airport in Jasper on Tuesday, April 26, 2005. Lynch recently took the reins as president of the company. The company expects to get funding soon to begin assembling the utility airplanes in Jasper. The turbine-powered airplanes will replace the current fleets of aging light twins and utility singles. 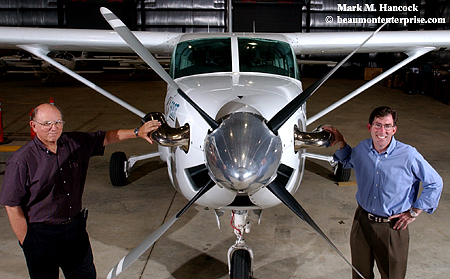 Explorer Aircraft Inc. president Bryan E. Lynch (right) and director of flight standards W.H. "Sam" Ketchum (left) pose for a portrait next to one of the company's products at the airport in Jasper. Due to small aircraft liability issues, light airplanes haven't been manufactured in the U.S. for many years. The average age of light twins with up to six seats now exceeds 34 years in the U.S. Twins with more than seven seats average 38 years old. 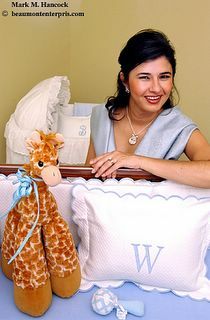 Elaine Browne poses for a portrait in the baby's room of her Beaumont home on Monday, April 25, 2005. Browne is pregnant with her first child. 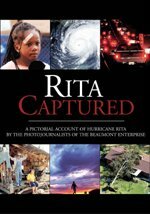 This image was needed as a cover for a business magazine The Beaumont Enterprise publishes. I haven’t seen the magazine yet, but I was told this is what they needed. The story is about preparing a room for new babies. I imagine I’ll see a similar assignment every few months. Cheryl Bouillon of KOLE news radio laughs during the Beaumont Chamber of Commerce annual LobsterFest at the Ford Park Exhibit Hall on Monday, April 25, 2005. John Stevens hosts the afternoon jazz program on KVLU at Lamar University in Beaumont on Friday, April 22, 2005. 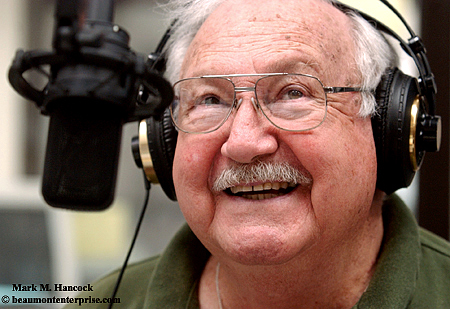 His careers have included playing the villain in a local kiddie TV show, banking, public relations and as a volunteer host at the radio station. 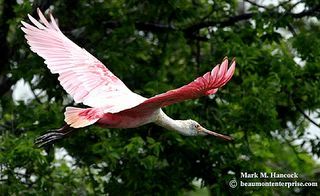 A roseate spoonbill (Ajaia ajaja) flies at The Rookery at Smith Oaks Bird Sanctuary in High Island on Thursday, April 21, 2005. These birds have a body about the size of a flamingo and get their color from eating shrimp (like flamingos). They also have a hilarious “la la la la la” call. Fay can imitate it well, but my Texas speech pattern is too slow to handle it (I took her there on Sunday to show her the alligators.). I shot this image while I was on a ride along my first week here. Scott did all the work while I got to make images of some cool birds. The sanctuary is about 30 minutes from Beaumont. Bird watching season is barely kicking off as the birds make the trek back north. This place is world renown for its density and variety of bird species. While we were shooting, we bumped into serious birders from Japan and Norway. One person described it as the "Superbowl of bird watching." 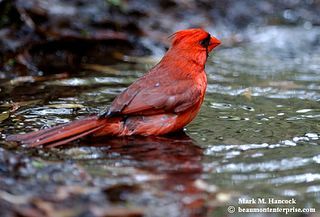 A cardinal (Richmondena cardinalis) takes a bath at the Boy Scout Woods Bird Sanctuary in High Island. 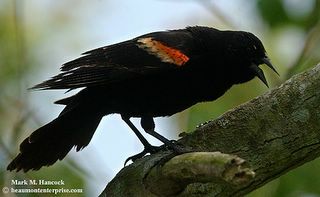 A redwinged blackbird (Agelaius phoeniceus) calls at Smith Oaks Sanctuary in High Island on Thursday, April 21, 2005. I'm starting to settle into the pattern here. I think I'm so accustomed to a complicated workflow that a simpler workflow is confusing. Because it's so straight forward, I keep thinking I must be doing something wrong. Thanks for reading while I settle in here. I should be back to my normal pattern (post a photo or PJ-related info) sometime soon. Crawfish wait to be eaten at Rocky's Roadhouse Grill & Spirits in Beaumont on Wednesday, April 20, 2005. 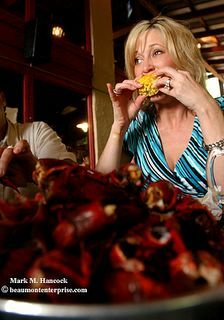 Each Wednesday evening the roadhouse offers 94-cent specials on selected beers and margaritas as well as cooked crawfish at $3 per pound and live entertainment. 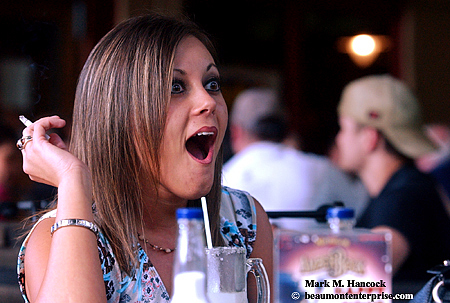 Lindsey Cheek of Evadale reacts during a conversation with friends at Rocky's Roadhouse Grill & Spirits. The roadhouse never charges cover on entertainment nights. 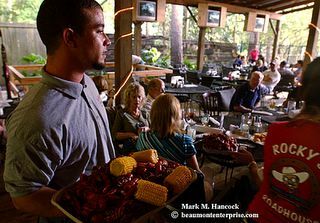 (Above) Waiter Vincent Bruno rushes to deliver crawfish and corn at Rocky's Roadhouse Grill & Spirits in Beaumont. Crawfish are farmed like catfish in the wetlands near Beaumont. (Right) Rachelle Huber of Beaumont eats corn at Rocky's Roadhouse Grill & Spirits. Crawfish are also known as "crayfish," "crawdads" or "mud bugs" and are closely related to lobster. 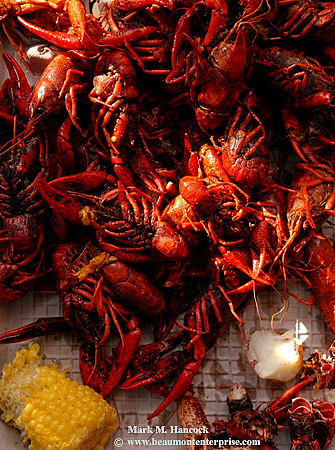 To learn a little more about crawfish see this site. 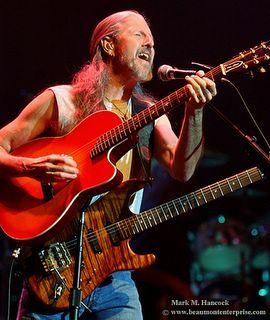 Pat Simmons of The Doobie Brothers performs during a concert at the Jefferson Theater in Beaumont on Wednesday, April 20 2005. Today I got to meet the famous Rusty Surette, the morning anchor for a local TV station during Beaumont orientation. We were both chasing a story, which never quite materialized. Thanks for all the supportive notes I've gotten lately. It's been really helpful. Yesterday consisted of paperwork and a ridealong. I got issued an identification badge, pager, keys, parking spot and camera equipment. The office is only seven miles from where we're living now. I've never lived this close to the newsroom, so it's very convenient. The workflow and some of the programs are different here, so I expect to have a learning curve for a few days, but I should figure it out. I'll be on a ridealong again today. Tomorrow I have a half-day ridealong, and then I have one shoot. I'll work through Friday this week. I'll shift to my regular Tuesday through Saturday "vampire shift" next week. This mean... I get a three day weekend. Whoo hoo! Fay and I plan to take a mini-trip to Louisiana this weekend to get past the move and have some fun before we buckle down with work. When I fought in karate tournaments (more than half a lifetime ago), I could determine how well I'd do by how edgy I got before the fights. If I was very edgy, I would take home at least one trophy (I was real wired at the U.S. Karate Championships and took 2nd in fighting for my division). If I got too comfy, the odds of taking home some brass declined. So, I think it's good I'm a bit edgy today. The new gig at The Beaumont Enterprise officially starts at 9 a.m. today. I'm sure today will consist of paperwork and drinking mass amounts of water for... a sample. I'll be doing ridealongs the first day or two to learn the workflow and then fly on my own. All anyone can do is their best. I'll do my best and keep trying to improve from there. Hopefully I'll figure out the niche this week. It falls between my first and second papers. So, I'm guessing it has qualities of both. In the meantime, I'm covering my rump and have gathered a lot of information about area events on my new blog. At a small paper, it's important for PJs to know what's happening when and where to fill holes in the paper. At large papers, editors schedule more than enough assignments from a day to a month in advance. Consequently, there really isn't any spare space and PJs' images fight for every hole. Additionally, when there are more than 30 PJs scattered across the area at large papers, only the assignment editor has a grip on where everyone is. Consequently, one PJ might try to cover an event as a feature and find another PJ covering it as an assignment. It's really a drag when that happens because all the time and images basically vaporize on the spot. The assigned PJ has the right-of-way. Since there are only four of us covering all of Southeast Texas, it shouldn't take much coordination to avoid stepping on each other. It leaves me a lot of room to collect features and work some stories. Then, it's a matter of space again. Tonight, I feel like a racehorse in the chute. Just open the darn gate and watch me run. 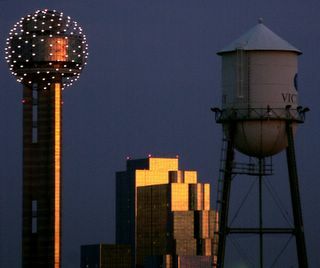 Dallas' Reunion Tower and hotel reflect the sunset while the Victory Park watertower glows in the sun's setting light. I planned to post the last two images the days before we left Dallas, but the DSL issue killed the plans. I tried to wait on the dial-up, but between Blogger's glitch and the slow speed, it simply didn't work. Sometimes things happen for a reason. At 4 a.m. I was watching a deer in the field across the drive. I heard some tires squeal and the rapid, high-pitch click of a fender bender in the direction of Wal-Mart. I looked to see what happened and lost sight of the deer. When I spotted the deer again, it had run across the field to see what happened. I never knew deer were rubberneckers. Whodathunk. BTW, there's also some cows living in the field. Fay found them most amusing. We are officially Beaumont residents. It took 25 hours to move everything from Dallas to Beaumont. I'd like to give special thanks to my sister Suellen and her husband John. The move wouldn't have been possible without their help. Now we are sifting through the boxes. It looks like we are going to be very happy here. The condo was nice while empty, but it's becoming even better as we settle in. Our DSL should be activated sometime Thursday. If so, I'll start posting images more regularly again. I'll be doing paperwork and other stuff for the first few days, but I should start producing new images by the end of next week. A quick view from our balcony on our final day in Dallas. And begin anew our home at last. Our lovely DSL provider did something wrong and turned off the speed one week too early. Consequently, I'll be packing and preparing to move instead of uploading my nightly images over a dial-up connection. Sorry for the gap. If all goes well, we should be up and running with DSL next Thursday (April 14). Since I can't adequately surf until then, I might even have a post on how to shoot soccer ready. Major Leagues Soccer (MLS) started this weekend, so it's good timing. In the meantime, you can find photojournalism (PJ)-related posts here. Being Native American, I tend to pay special attention to the animals around me. If I see or hear animals (both alive and dead), I note the animal and consider why they presented themselves to me. I have a special interest in eagles and owls (called the Night Eagle). The Night Eagle sees the truth through the darkness. It also signals a time to use powers of keen, silent observation and intuition for some life situation. When I was confused during a very low point in my life, a great horned owl started hooting so loud I could hear it through a closed window. It helped me figure out what I needed to do next. Shortly afterward, I met Fayrouz online. More recently, the little barn owls talked to me and shortly afterward I was offered the Beaumont job. Tonight, I'm sifting through information about Beaumont. I'm hunting down events and looking for story ideas (expect alligator stories). I took a break and stepped onto the balcony and a great horned owl was hooting so loud and frequently that I thought it was a dog at first. So, I believe I have some good things coming my way soon. Stay tuned. Last night, I was kneeling on the floor of a dimly-lit hotel ballroom next to a gold-plated rifle waiting on a man in a tuxedo to do something other than spit dip into a beer bottle. That's when I realized my knee was in a puddle of cow pee. I thought, well, it's already soaked into my jeans, so I might as well wait and get the shot. Then, a longhorn bull kicked green sawdust and gold stars all over me and my camera. Joy. If this were a dream, I'm sure it would take years to unravel its meaning. Instead, it's a minute in the life of a PJ.